As the Editor of this fine blog (if I do say so myself ;-)) I am in a unique position. While I certainly consider myself a devoted member of the ManageWP team (and have been for over 18 months now), I am not directly involved in the ongoing development or support of the app itself. I am a ManageWP user and a ManageWP team member, but I’m not on the “front lines,” so to speak. With the above in mind, Vladimir (our CEO) asked me to write an honest appraisal of the ManageWP app and the team that develops and supports it. Because he is well and truly inside of the operation, he wanted to know what I thought of team ManageWP and the future of the app. That is exactly what I have done in this post. As a ManageWP team member, these are the areas in which I would like to see us excel. As a ManageWP user, these are the areas in which I would like to see the app excel. Now here’s the tough question: does it? The first time I came across ManageWP (which was shortly before Vladimir asked me to write for this blog back in November 2011), I was astonished at (a) how much easier it made WordPress website management and (b) how no one had thought of this before. Vladimir was definitely ahead of the curve. Fast forward many months and I believe that ManageWP is still at the forefront of multiple WordPress site management. There are certainly more competitors around these days, but the core functionality of the software (to make maintaining WordPress sites quick and easy) is still unparalleled (in my humble opinion). 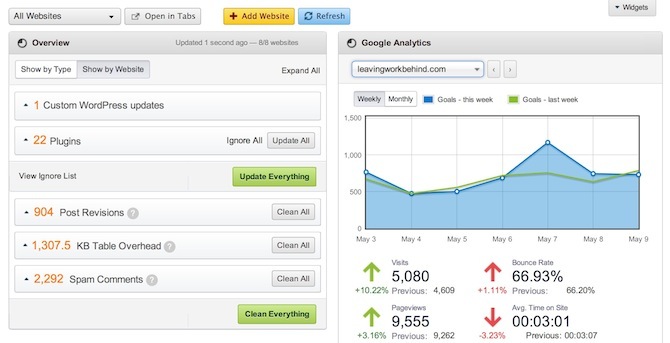 22 plugin updates spread over eight websites — all updatable with the click of a button. And that’s not to mention the Post Revisions, Table Overhead and ever-present Spam. The one-click update process has only got easier since I started using ManageWP. What was once occasionally a little playful now operates flawlessly every time. To think I once logged into every site individually to update plugins! But what really excites me about the management aspect of ManageWP is that the team is still so passionate about improving what is still the fulcrum of the app. They haven’t lost sight of what makes ManageWP so important, and that fills me with confidence for the future. Security has become more and more important to me over the past few weeks, largely prompted by my own blog being hacked. On Monday I will be publishing an in-depth piece on how secure WordPress really is, and just a couple of weeks ago I published a comprehensive post on how to secure your WordPress website on my own blog. The first thing I’ll say about ManageWP is that it is secure; and that’s obviously a huge priority. The team employs complex layers of security to ensure that data passed between your websites and ManageWP is never exposed — I don’t understand the science, but I do know that ManageWP’s reputation for security is pretty flawless. I know that everything is hunky dory. Furthermore, with increased concerns regarding WordPress security, I know that the team are hard at work making sure that ManageWP can be as effective as possible in preventing breaches in the future. Let’s face it — existing features are all well and good, but we all thrive on the possibility of what is to come. And you only have to look at ManageWP’s track record of introducing new features to see that we are in good hands. I think that one of the best things about being a ManageWP user is waiting to see what the team comes up with next. The sheer depth of functionality is impressive and (I believe) unparalleled. This is the area in which I am perhaps most proud of the ManageWP team. I know that Vladimir has poured a lot of resources into support and I really think it shows. In fact, back in February he published a post on the topic in which he was able to boast of an astonishing 36 minute (average) response time! Having dealt with plenty of online businesses in my time I know that 36 minutes blows the competition out of the water. Furthermore, nearly half of all tickets are resolved by the support team’s first answer. I’ve personally dealt with the support team more than once and know that the numbers are backed up by their performance in reality. I am so glad that the ManageWP team performs so well in terms of support because when it comes to an app like this, support is arguably the most important feature. When we’re managing our websites and we come across a problem, we need it resolved pronto. Time is money, as the old cliché goes. I want to add a caveat to all of the above in the interests of complete honesty — ManageWP isn’t perfect. Nothing is. There are things I would like to see improved in an ideal world (incidentally, I know that the team is already working on those things), and features can always be tweaked to perfection. But the reason I am a ManageWP user and would never consider switching to a competitor is that I know there are a team of 20+ people working practically around the clock to make it a better app than it was yesterday. And as our currently ongoing competition demonstrates, we are always looking to get feedback from you: the ManageWP user. The sheer willingness of the team to really listen to its users and act on what it hears demonstrates to me that we are all in safe hands. With that in mind, I’d love to get your thoughts on ManageWP. 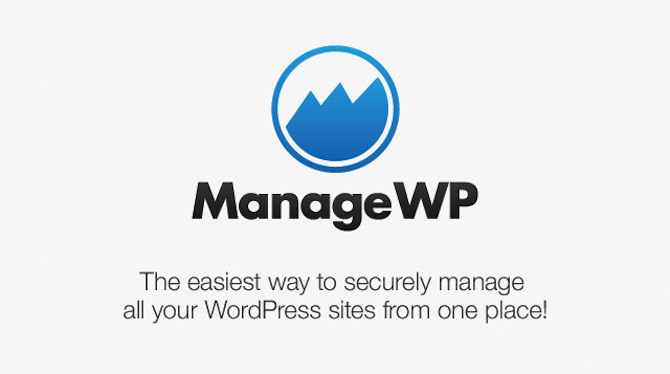 Do you think it is the premier solution for multiple WordPress website management? What do you love about the app and would you like to see improved and/or changed? Let us know in the comments section below! I think it is a good tool, but the pricing model doesn’t work for me. Maybe ManageWP wants to discourage a lot of low-end users, but a low, per-month, per-site option would work best for me. The spread of features to different tiers of accounts also doesn’t work well for my needs. I need one or two of the highest tier features, for instance, but the jump in price is too high. I signed up for a year and will not renew unless I see this beginning to change. Yeah I’ll have to test out this management console it looks cool but I had a bad experience once before with a custom console that crashed my site so I’m a bit weary. Anything that saves time is a plus. I wish you guys would share this theme though, that would be cool.